Texas Freckles: I'm feeling the love. I'm so glad I took the scrappy log cabin apart. This is my first attempt at sashing, but it was pretty easy. I'm liking it much better now. It's about four inches too long for the backing I prepared pre-sashing. I'll have to add a little to the one end of the backing, but it's a patchwork anyway, so it won't be an issue visually. It's a very generous throw, maybe big enough for two. It's only a few inches shy of twin sized at 69 x 82.5". If I'd know I was ultimately going to this way, I would have started each log cabin with a white square. But, I'm not feeling the love enough to "fix" that. 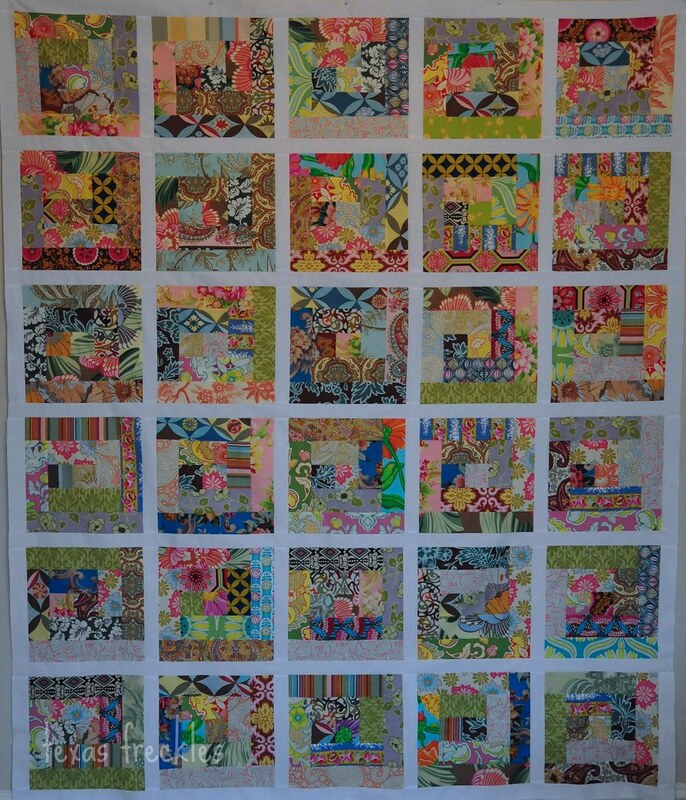 I'm anxious to start on the quilting. I think I'm going to try doing loops rather than stippling, like this from Crazy Mom Quilts. I'll have to make another placemat to try it out since I haven't done it before. It looks great! I have to say - I just did (or should I say tried to do) that same overall loop pattern. My loops don't look nearly as good as AmandaJean's. 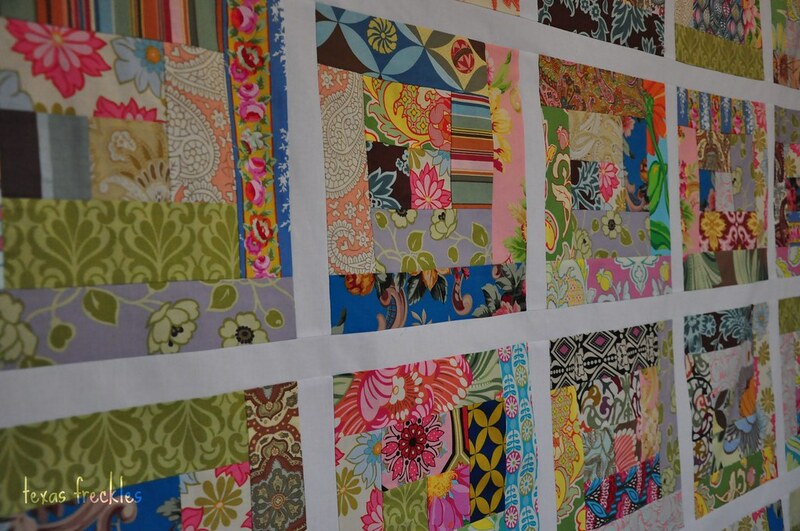 hi Melanie, thanks so much for the nice comment on my arcadia quilt!! i uses a charmpack and some yardage and i do love the sanae design, too. oh, and congrats on your oh fransson-win - that is sooo fabulous! It is beautiful! The white sashing was a great addition. I think your were right it definitely needed this. Looking forward to seeing the quilting. I can't believe it... I won!